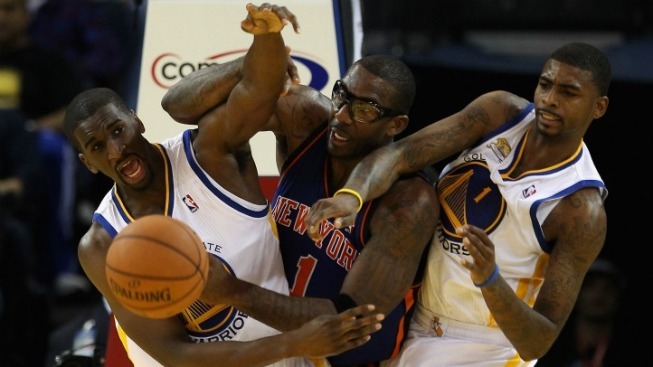 The Warriors came out and played; The Knicks not so much. If you took everything the Knicks did wrong in their opening win over the Celtics and took out the positives, you'd have something that looked an awful lot like the performance against the Warriors on Wednesday night. And that, my friends, is going to wind up as a losing effort every single time. The final score was 92-78 this time and, frankly, it was surprising it was that close. The Knicks defense was terrible, with every Warrior cut and screen leading to a wide open player scoring an uncontested bucket as if Tyson Chandler didn't exist. He might as well have been in Dallas as he couldn't stay out of foul trouble and the dropoff to Josh "Jorts" Harrellson is the basketball equivalent to the drop between the George Washington Bridge to the Hudson. Rebounding was worse than it was against the Celtics, especially on the offensive glass where the team picked up just four caroms. Bad as their rebounding might be under any circumstances, it isn't helped by the way they approached the offensive game last night. They settled for far too many outside shots and isolation plays, especially when Toney Douglas was in the game at the point. It's only been two games, but we're about ready to issue a final verdict about Douglas' unsuitability to play major minutes as the point guard for this team. He took 11 shots and dished two assists on Wednesday night, a terrible ratio and one that leads to a lot of standing and watching on offense because ball movement dies and the team is left to hoist up nothing but contested shots. There will be nights when that works out okay because of how good Carmelo Anthony and Amar'e Stoudemire are, but they shot 8-for-27 in this loss as they took on the entire defense by themselves. There isn't going to be much choice other than just giving the ball to the stars and hoping it all works out until the team finds guards capable of hitting open man and running a multi-faceted offense. One bright note on that front is that the team looked much more fluid offensively when Mike Bibby was on the court in his Knicks debut, but Bibby comes with his own shortcomings defensively that will make it hard to hand him serious chunks of playing time if the rest of the team remains so allergic to defense. Hopefully things work a little better in Los Angeles on Thursday night, because Wednesday was a serious dunk in freezing cold water after the fever dream end on Christmas Day.